Youth justice has become an increasingly important part of the criminal justice system, and has faced a wide range of challenges in the last few years. Practice within the youth justice system has become increasingly professionalized, with important roles being played locally by Youth Offending Teams and custodial establishments, and centrally by the Youth Justice Board (YJB). Key to the professionalisation of the workforce has been the YJB's Effective Practice Strategy and associated HR and Learning strategy that seeks to enable youth offending services and individual practitioners within them to work in ways that are evidence based and informed by the most reliable and up to date research. This book is an amalgamation, significant update and revision of a series of Readers in the key areas of effective practice identified by the YJB. 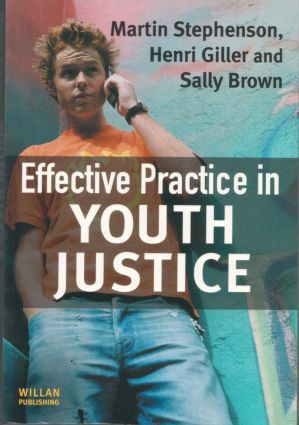 It draws together the best available research in each of eleven key areas of practice, considers the principles of effective practice as they relate to those areas and identifies the challenges for those working in the youth justice system. The book is an essential resource for people working within the youth justice system, those training to work in youth justice, and students taking courses in youth justice as part of criminology or criminal justice degrees. Providing a comprehensive and up-to-date review of research and the implications for practice, it is designed to meet the needs of students taking YJB sponsored courses with the Open University, in particular K208 (the Professional Certificate in Effective Practice) which forms part of a wider Foundation Degree.